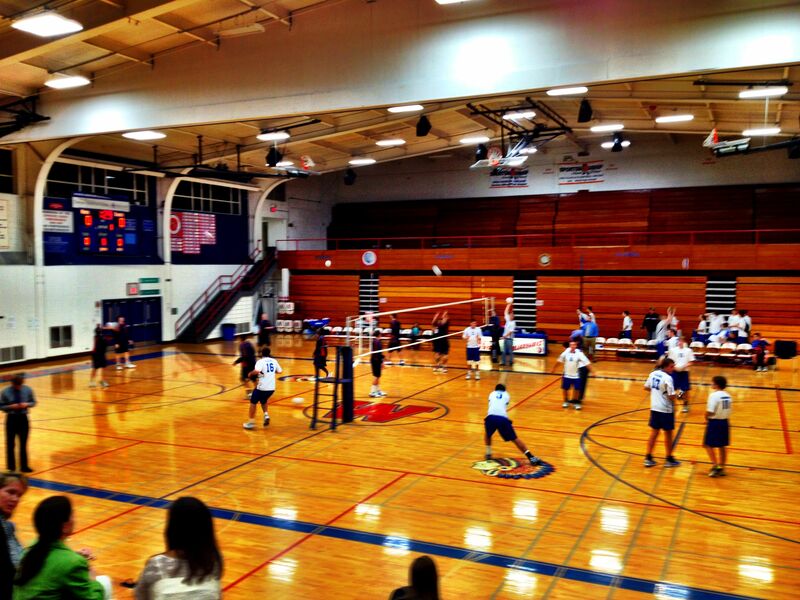 The teams warm up before Thursday’s DVC match at West Aurora. West Aurora continued its strong start in the DuPage Valley Conference with a hard fought victory over Wheaton North on Thursday. Outside-hitter David Vasquez had 11 kills and outside-hitter Eric Roggeman registered 10 as the Blackhawks defeated the visiting Falcons 25-15, 26-24. After comfortably winning the first game 25-15, the Blackhawks fell into a quick 6-0 hole in the next game. West Aurora (10-4, 3-1) fought back to tie the score seven different times before middle-hitter Joe Frommert’s kill gave the Blackhawks their first lead of the game, 25-24. On the ensuing point, Roggeman and Patrick Ronan set up a match-sealing kill by Vasquez. The 6’2” senior credited the adept passing ability of Ronan. Vasquez said he never doubted his team’s ability to win the match, even when the Blackhawks faced an early deficit in the second game. Middle-hitter James McGrath had five kills and his block on game-point clinched the first game for the Blackhawks. The kill-leader for Wheaton North (5-11, 0-4) was middle-hitter Alex Jackson with six. Outside-hitter Zachery Sinn had four kills, while setter Alex Donahue had 12 assists and two blocks. 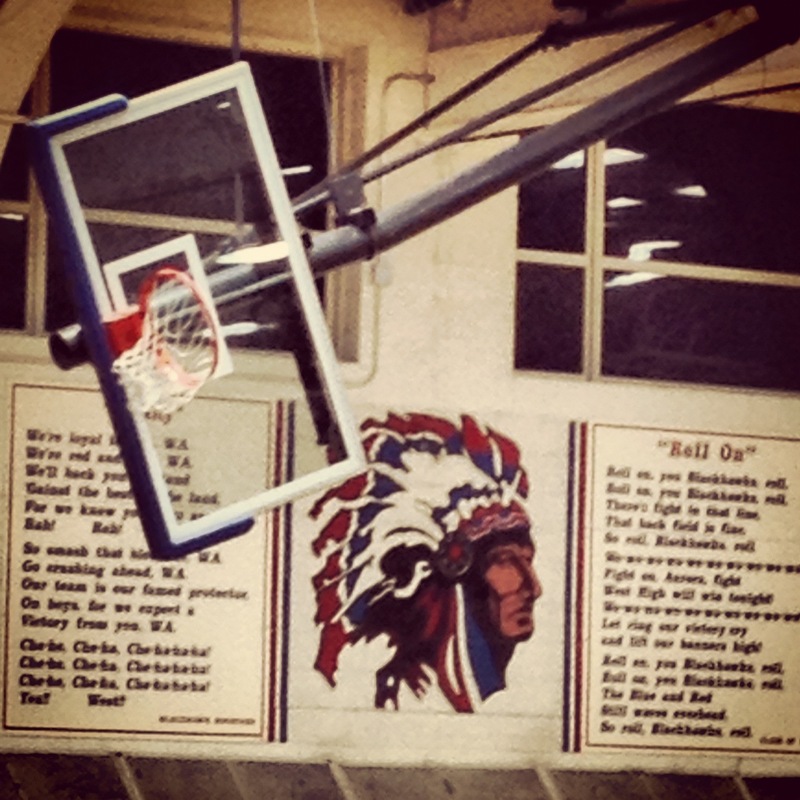 Instagram of mural in West Aurora’s gym. I’m a sucker for Indian head logos. Wheaton North second baseman Kevin Fahy broke out of his early season hitting slump just in time for the start of the Falcons’ DuPage Valley Conference slate. The senior went 4-for-4 with two RBI as the Falcons defeated host Naperville North 6-1 on Tuesday, a day after he went 3-for-3 in a Falcons’ victory. Fahy says working with Wheaton North (8-5, 2-0) hitting coach Josh Coan helped turn around his season at the plate. Falcons pitcher Lake Bachar turned in a complete game, giving up one run and seven hits while striking out seven and walking none. Bachar also recorded two hits at the plate, including an RBI single in the seventh inning. Bachar stepped up his game with runners on base, stranding seven Huskies. The Huskies had runners on first and third with one out in the second inning before Bachar struck out Kevin Garon and Marques Winick to get out of trouble. The Falcons took a 1-0 lead in the second inning after River Williams scored on a sacrifice bunt by Ed Norris. The Huskies answered quickly, as Pat Mollo’s RBI single in the bottom half of the inning tied the score at 1-1. After the Falcons took a 2-1 lead in the third inning on an RBI groundout by Williams, Fahy extended the Wheaton North lead to 4-1 with a two-run single in the fourth inning. The Falcons got two insurance runs in the seventh inning on RBI singles by Ryan Jordan and Bachar. Naperville North center fielder Mariano Long went 2-for-3 with a double, triple and deep fly out to center field. Despite the Huskies’ inconsistent start to the season, Naperville North (4-8, 0-2) coach Mark Lindo believes the team is on the verge of breaking out. Wheaton North head coach Don Helberg knew his boys track team was special, he just hoped his athletes would rise to the occasion at the Dupage Valley Conference indoor championship. And boy did they ever. The Falcons soared past the competition, tallying 143 points to become conference champions. West Aurora finished second with 82 points, paced by their 200 relay team (Marquette Sanchez, Tony Oros, Parrish McGhee, Benny Prunty) which took first place and set a meet record (1.32:32). Parrish McGhee was the Blackhawks’ workhorse, according to his head coach. McGhee ran in four different events, and placed in three of them—finishing third in the 200, sixth in the 55 dash and first as part of the 200 relay. Lamb was pleased with his team’s second place finish, and believes it’s a sign of good things to come in the spring. Naperville Central finished fourth with 66 points while Naperville North finished sixth with 31 points. Central captured first place in four events, including both the 400 and 800 relays. 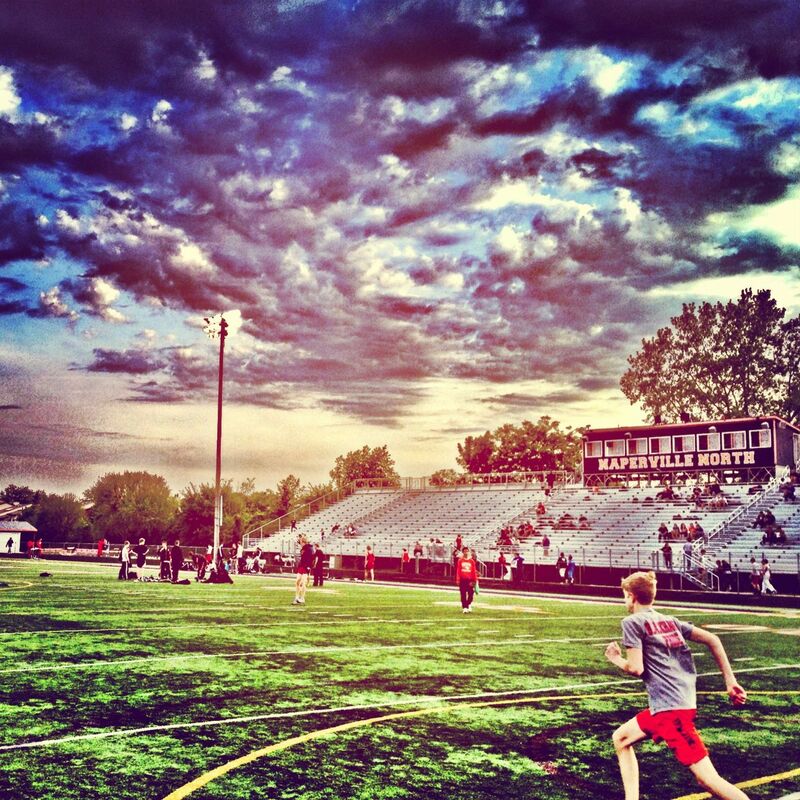 Sam Bransby captured first for the Redhawks in the 400, and was part of the first-place 400 relay. Mike Juretschke took first in the pole vault. Jimmy Qiao placed in two events for North, finishing fifth in the 1600 and second as part of the 800 relay. 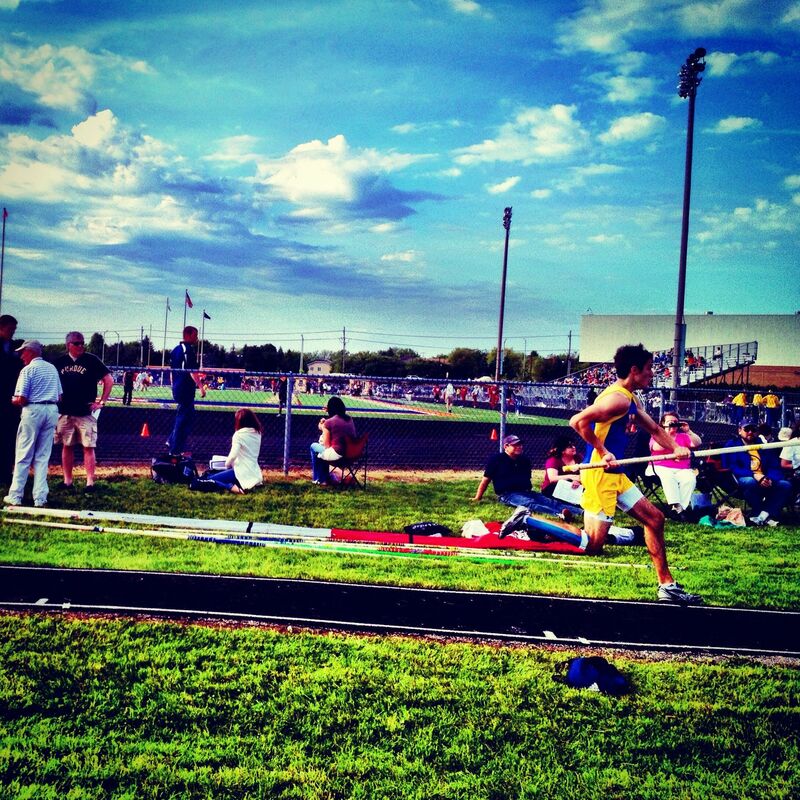 In total, six Huskies placed in their events, with Nick Lyon posting the best finish (second place, pole vault). Five Wheaton North athletes took first place in their events: Alex Ryan (800), Paul Steeno (1600), Marcus Charles (200), Christian Hollinger (shot put) and Zac Daniels (triple jump). The Falcons had two athletes finish in the top-six of six different individual events (3200 meter, 55 meter, 400 meter, shot put, pole vault and triple jump). “I think we’re a well balanced team, and that made the difference,” said Helberg. I wrote this story for the Chicago Sun-Times and yourseason.com. It appears here. Montini scored four touchdowns over a 12 play stretch in the second half to pull ahead from Woodstock North in the Broncos’ 49-14 first round victory. The Broncos took a 21-0 lead in the first quarter, but the Thunder battled back and cut the score to 21-14 in the second quarter. From there though, it was all Montini, as the defensing 5A state champs scored the final 28 points of the game. Wide receiver Jordan Westerkamp had another star performance, hauling in 7 catches for 127 yards and a touchdown. The Nebraska-bound senior also had a 52 yard punt return for the game’s first touchdown. Quarterback John Rhode continued his string of excellent games, completing 17 of his 25 pass attempts for 330 yards and four touchdowns. After losing in the first round of the playoffs the last two seasons to Montini, St. Francis broke through to the second round for the first time since 2008 when the Spartans won the Class 5A championship. Defensive back Michael Hanson’s interception in the third quarter was the key play of the game. Trailing 14-10, Burlington opted not to punt on 4th and 13 from the St. Francis 36-yard line. Rockets QB Ryan Ritchie overthrew his target, and the ball landed in the hands of Hanson, who returned the pick 70 yards for a touchdown that put the Spartans up 21-10. 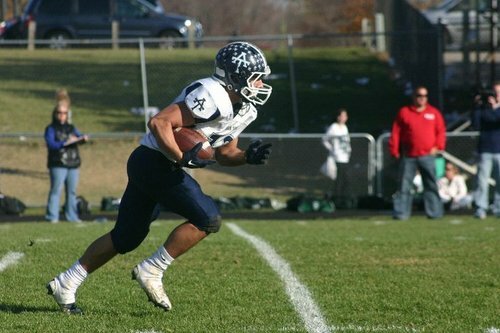 Running back Jack Petrando led the Spartans with 18 carries for 112 yards and a touchdown. Quarterback Nick Donati added two touchdowns, one through the air and another on the ground. St. Francis faces a tough test in the second round where they will go on the road to face #1 Kaneland at 7 pm on Saturday. Nazareth running back Joshua Moore ran for 160 yards and four touchdowns in the Roadrunners dominant 35-6 first round win over Deerfield. The Roadrunners took a 28-0 lead into halftime after holding the Warriors to just 19 yards of offense in the first two quarters. Deerfield scored its first and only touchdown with just 26 seconds remaining in the fourth quarter. Nazareth will host Cary-Grove next Saturday at 1 pm in the second round. The Roadrunners will be looking to advance to the quarterfinals for the second time in school history. Running back Wesley Sanders scored two touchdowns as Glenbard South defeated Foreman 30-7 in the first round of the class 6A playoffs. The Raiders played a sloppy game (5 fumbles, just one lost) without their starting quarterback Tyler Padera (concussion) but still dominated Foreman. Glenbard South took a 30-0 lead in the fourth quarter. The Raiders will host Prairie Ridge next Saturday at 7 pm. The two teams met the first week of the season with Prairie Ridge winning convincingly 55-12. Things started out well for Marmion, as the Cadets recovered a fumble on Prairie Ridge’s first offensive play of the game. However, the Cadets had a field goal attempt blocked on their ensuing possession, and things quickly went down hill. Prairie Ridge went on to dominate the first half, taking a 42-0 lead into halftime. Quarterback Nick Nissen (12 carries, 38 yards) ran for four touchdowns. Running back Connor Greenwald added a touchdown and led the Wolves with 144 yards on 11 carries. Marmion earned just one first down in the game while gaining only 23 yards of total offense. Fenton struck first, but the Bison were unable to keep things going, losing to Lake Forest 55-20 in the first round of the class 6A playoffs. Play-making running back Alan Geneva led the Bison with 10 catches for 97 yards and one touchdown. Lake Forest running back Owen Williams (16 carries, 130 yards) reached the end zone four times for the Scots, who will face #1 Batavia in the second round. Running backs Jordan Kos and Brian Brennan led the way for Carmel as they upset Addison Trail 28-20 in the first round of the class 7A playoffs. Kos led the Corsairs with 31 carries for 167 yards and one touchdown while Brennan added 20 carries, 78 yards and two touchdowns. Addison Trail had only given up 48 points in the regular season, and never gave up more than 14 points in a game. The Blazers drove down to the Carmel 11 yard line late in the fourth quarter in an attempt to send the game to overtime. However, the Corsairs forced two incompletions and time expired. AT Quarterback Trevor Bermingham completed 19 of his 33 pass attempts for 177 yards, two touchdowns and two interceptions. Carmel will host Crystal Lake South in the second round. The game kicks off at 7 pm Friday night. 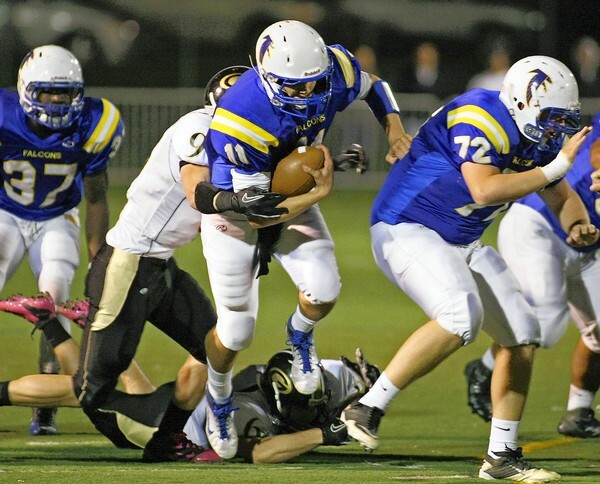 John Peltz had another strong performance as Wheaton North flew by Jacobs 28-0 in the first round. Peltz completed 13 of his 19 pass attempts for 277 yards and four touchdowns. The junior added another touchdown on the ground. Sophomore Matt Biegalski caught 5 passes for 165 yards and a touchdown while senior Johnny Daniels had 3 grabs for 73 yards and two touchdowns. The Falcons’ defense was able to shut down Jacobs by holding down running back Caz Zyks. The talented back with a sweet name only gained 27 yards on 11 carries. Wheaton North will face Rockford Boylan, the defending 6A champions, in the second round. That game kicks off at 1 pm Saturday in Rockford. Glenbard North only completed two passes in their 27-21 fupset win over Barrington, but the second one happened to be the play of the game. With the scored tied at 21 halfway through the fourth quarter, Panthers quarterback Brian Murphy threw up a prayer into the end zone. The ball somehow fell into the hands of Logan Henshall for a touchdown (also Henshall’s first catch as a varsity player) and the Panthers took a 27-21 lead. Once again, most of the Glenbard North offensive production came from the Jackson brothers. Junior Justin (17 carries, 95 yards) reached the end zone three times, while senior Phil ran for 122 yards on 21 carries. The Panthers advanced to the second round where they will host Palatine at 6 pm on Saturday. Class 7A and 8A Playoff Mini-Previews: AT Is For Real, How Far Will They Go? Addison Trail finished off a perfect run through the West Suburban Gold last week with an upset victory over previously undefeated and Class 8A 3-seed Downers Grove South. The Blazers’ strong defense was able to shut down Mustangs running back Justin Williams (20 carries, 51 yards), who had run free all season long, totaling close to 2000 yards on the ground. Addison Trail’s only loss came to Glenbard West, one of the two No. 1 seeds in the 7A playoffs. The Addison Trail defense, led by linebackers Mike Imperiale and Kevin Kent, has had a dominant season. The Blazers shut out four opponents and allowed just 48 total points in the regular season. The Blazers are led on offense by running backs Anthony Catanese and Anthony Messina. Despite their 8-1 record and conference crown, the Blazers did not receive a easy path in the playoffs. AT was only given a 6-seed and they draw a tough Carmel team in the first round. Carmel lost three games this season by a total of eight points. Two of the Corsairs losses came by just one point, including a 64-63 double overtime loss to Marist in week eight. Carmel also handed Nazareth their only defeat of the season in week two. The Corsairs’ offense, led by running back Jordan Kos, comes into the playoffs having scored 42 points or more in four straight games. Kos, the school’s all-time leading rusher, ran for more than 600 yards and 12 touchdowns in Carmel’s final three games of the season. The Blazers were able to shut down DGS’ Williams last week, but will they be able to contain Kos? The match-up between Kos and the dominating Blazers’ defense will be fun to watch. No team has scored more than 14 points against Addison Trail this season. Wheaton North had won six straight games before the Falcons dropped their season finale 27-13 to their crosstown rivals, Wheaton Warrenville South. The Falcons are led on offense by dual-threat quarterback John Peltz and running back Patrick Sharp. Sharp missed a few games in the middle of the season due to injury, but he seems to be healthy and running strong. The Falcons will face a tough Jacobs squad in the first round. Jacobs defeated Dundee-Crown 49-0 last week after dropping their two previous games to teams with 8-1 records (Prairie Ridge and Crystal Lake South). The Golden Eagles feature a run heavy offense, led by a running back with a sweet name, Caz Zyks. The 5-10 senior ran for 181 yards and three touchdowns last week against Dundee-Crown. The winner of this match-up will likely play Rockford Boylan, last year’s 6A champion, in the second round. Glenbard North was able to snap a three game losing streak last week with a 34-10 win over Naperville North. The Panthers, as they have all season, relied on the Jackson brothers to lead them to victory. Phil and Justin Jackson combined for 253 rushing yards and four touchdowns last week. Older brother Phil has been the workhorse for the Panthers, but Justin has made an impact on offense backing up his brother and on defense as a safety. The Barrington Broncos, second place finishers in the Mid-Suburban West, come into the playoffs on a three game winning streak. The Broncos features a run first offense led by a strong offensive line. The O-line is anchored by Wisconsin commit Dan Voltz. Running back Chase Murdock ran 36 times behind that line for 315 yards and four touchdowns in Barrington’s 29-28 victory over Conant in week seven. The Broncos got a boost from their special teams last week as Dylan Zyzda returned two kickoffs for touchdowns. The Broncos have a marquee win on their resume, they gave 8-1 Elk Grove their only loss of the season in week two. WHAT HAVE THEY DONE SINCE WE LAST MET? 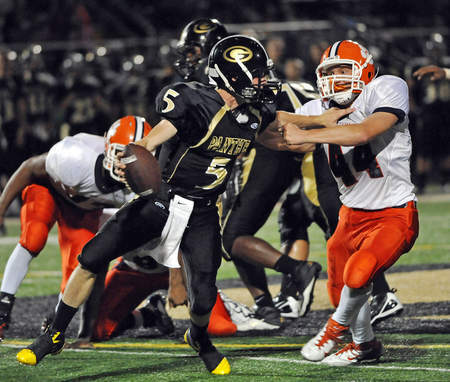 The Panthers offense struggled last week as Glenbard North lost their first game, 10-6 to Naperville Central. Phil Jackson went over 100 yards rushing again, but he was only able to reach the end zone once. Most troubling for the Panthers, starting QB Brian Murphy was knocked out of the game with an injury. Murphy runs well and he had a break out game through the air three weeks ago against Glenbard East when he threw for 229 yards and two touchdowns. The Panthers end the season with a tough stretch of games against three of the best teams in the Dupage Valley Conference. That stretch could get even more challenging if the Panthers are missing their starting signal caller. The Falcons have won four straight games, but the competition is about to get a lot tougher. Their previous three opponents have combined to win three games this season. However, their next three opponents have combined to win 12 games, and are all part of the four-way tie for second place in the DVC. 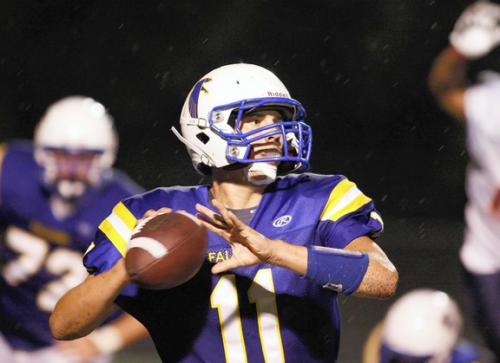 The Falcons are led by quarterback John Peltz who has thrown for 970 yards and nine touchdowns this season. Peltz is the best quarterback I have seen this season, and the Falcons will need him to keep performing at the level he has been playing at if they are to hold on first place in the DVC. After starting the season off 2-2, things are looking up for the defending 5A State Champions. The Broncos have won their last two games against solid conference opponents, Aurora Christian and St. Francis, and have done so in impressive fashion. Montini has outscored their last two opponents 88-28. Montini’s schedule was front loaded. They lost two early games, but both defeats came at the hands of 6-0 teams, Loyola and Marian Central. Montini got a boost last week from the debut of quarterback John Rhode. Rhode, a transfer from Marian Central, missed the first five games of the season while recovering from a thumb injury. Rhode took over the quarterbacking duties at halftime, and looked great, tossing three touchdowns in the second half. Two of those touchdowns were caught by star wide receiver Jordan Westerkamp. The Rhode-Westerkamp connection may take the Broncos to another state championship this season. Addison Trail is off to the best start in school history thanks to its stifling defense. Led by linebackers Kevin Kent and Mike Imperiale, the Blazers have shut out four of their opponents, and have only given up 13 points through six games. The Blazers have two tests against undefeated teams left on their schedule, and both games are at home. 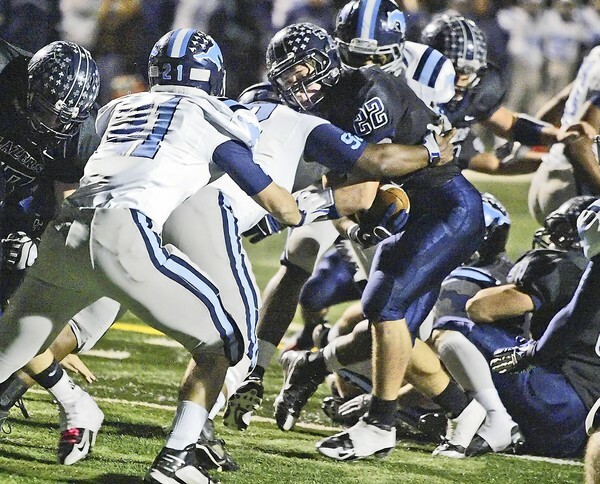 In between they face a hapless Willowbrook squad that recently lost 48-7 at home to Proviso East on homecoming. First up is a meeting with Glenbard West this Friday night. The Hilltoppers may be without starting QB Justice Odom, who was injured Saturday in a win over Proviso West. AT ends the season with a de-facto West Suburban Conference Championship game against Downers Grove South. Is the Blazers defense as dominant as the stats suggest? We will find out over the next three weeks.